Research has shown that interacting with animals, particularly in a structured therapeutic setting, can have a dramatic impact on an individual’s sense of well-being, stress levels, and overall mental health. The human/animal connection goes back thousands of years in human history, with animals providing human beings with numerous tangible and intangible benefits. Recent studies have documented the positive effect of this relationship in a measurable reduction of stress levels and a significant psychological impact, especially for individuals who have closed themselves off from human relationships and their own emotional states. 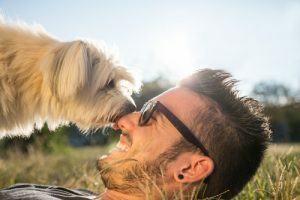 Animal-assisted therapy can allow these individuals to open themselves up and examine critical issues that relate to their substance abuse or mental health problems. At Seaside Palm Beach, we provide animal-assisted therapy for addiction for all our patients who undergo luxury drug rehab here at our facility. Anyone who has ever owned a pet or spent a significant amount of time around one understands the inherent stress relief they offer. Their unconditional love can often make us feel like they are our best and perhaps only friend in the world. This understanding is what prompted Seaside Palm Beach to create a residential rehab program where our patients are allowed to bring their pets to our facility. Engaging in animal-assisted therapy can help so many individuals stay on track in their recovery efforts. Stress can be a major factor in the onset of drug triggers. When patients experience pain and discomfort during the withdrawal process, the love of a pet can really help them get through the difficult moments. Going through the rehab process removes patients from their everyday lives. Permitting their pets to stay with them gives them some comfort in familiarity, while also giving them the responsibility to care for another life. This promotes the type of selflessness and self-awareness needed to succeed in addiction recovery. The pets themselves serve as forms of rehabilitation. Oftentimes, it is best for patients to spend time with pets in therapy, as opposed to opening up to friends and family. Pets offer a non-judgmental ear that recovering substance abusers need. There are many different types of therapy approaches that specifically help addicted individuals overcome the disease and animal-assisted therapy is one of them. The support of an animal companion can go a long way during the recovery journey and many people rely on their pet’s love during this time. Recovering addicts may feel lonely or empty during rehab and being in the presence of animals can truly help you cope. If you are struggling with addiction and you don’t know where to turn, Seaside Palm Beach can help you overcome this disease. We provide animal-assisted therapy for addiction at our facility and our patients find support through this companionship. Contact us at our luxury drug rehab today for more information on our customized addiction treatment programming and how we can help.